Russian manned lunar lander. Reached mock-up stage, 1972. 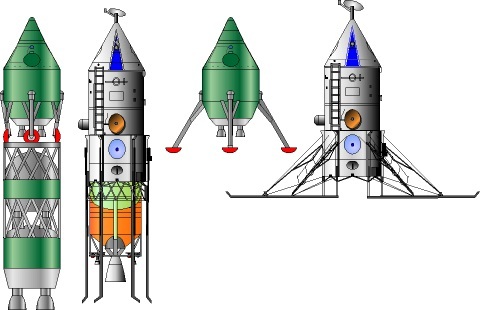 The LK-3 was Chelomei's preliminary design for a direct-landing alternative to Korolev's L3 manned lunar landing design. Status: Mock-up 1972. Gross mass: 45,000 kg (99,000 lb). Height: 23.50 m (77.00 ft). Diameter: 4.10 m (13.40 ft). Span: 4.50 m (14.70 ft). It would have used the 1966 version of the UR-700 booster to send a crew on a direct flight to the lunar surface and back. By the time of the draft project and mock-up stage, it had evolved into the more elegant LK-700 design. Chelomei's TsKBM began work on the UR-700 launch vehicle for manned lunar landing missions in 1962. Variants were studied with 70 to 175 metric tons low earth orbit payload, and rocket stages of various thrust levels, including nuclear stages. The conclusion was reached that a direct lunar landing would require a payload of 130 to 170 metric tons. Initial designs of the lunar lander, dubbed LK-3, were derived from the 'Raketoplan' family of manned modular space vehicles and LK-1 circumlunar manned spacecraft. Korolev's N1-L3 design lunar orbit rendezvous concept was selected in 1964 for the manned lunar landing. However the project quickly encountered delays and weight growth which threw into question its fundamental feasibility. On 20 October 1965 authorization was given for Chelomei to take the UR-700 and the lunar landing spacecraft, now officially dubbed the LK-700, to the draft project stage. 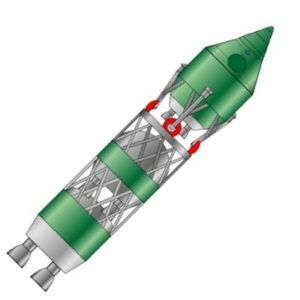 At this time Chelomei's lunar landing configuration consisted of the preliminary UR-700 design (8 unitary blocks arranged around the core second stage as the first stage; second and third stages taken from the UR-500K). The first and second stages would fire simultaneously at launch, using nitrogen tetroxide and UDMH propellants. The original LK-3 design consisted of a BSO was equipped with the retro-rocket for deorbit of the VA capsule following separation from the space station. It also provided the additional battery power, orientation rockets, and radio equipment that gave the VA a 31 hour autonomous flight duration after separation from the station. The original UR-700/LK-700 design was evaluated in October 1966 by an expert commission headed by Keldysh. Keldysh managed to ensure that the N1-L3 continued for the lunar landing mission. But it could not be denied that the UR-700 showed much better growth potential than the N1. Therefore, in order to support future lunar landing and manned interplanetary projects, Keldysh recommended continued extensive research on the UR-700/LK-700 design in order to obtain confidence in the technical solutions proposed. Further development of the LK-700 manned lunar landing spacecraft was undertaken in accordance with decree 1070-363 of the Soviet Ministers and Central Committee of the Communist Party on 17 September 1967 and MOM decree 472 of 28 September 1967. By the time the final mock-up and the draft project had been completed, the original LK-3 layout had been significantly modified to the final LK-700 configuration. Crew Size: 2. Spacecraft delta v: 9,061 m/s (29,727 ft/sec). Family: Lunar Landers, Moon. Country: Russia. Launch Vehicles: UR-700. Propellants: N2O4/UDMH. Agency: Chelomei bureau. Bibliography: 191, 1999, 288, 429, 443. Landing stages for Soviet lunar expeditions. Top row, left to right: L3 original version; LK; LK-3; LK-700; two versions of the L3M; LEK for Energia-launched lunar landing. Bottom row, lunar base elements: Chelomei KLE; Chelomei Heavy Lunokhod; Barmin DLB base module; LZM, LZhM, Lunokhod, and LEK for Glushko LEK Vulkan-launched lunar base.